It’s officially time to get into the Christmas spirit. 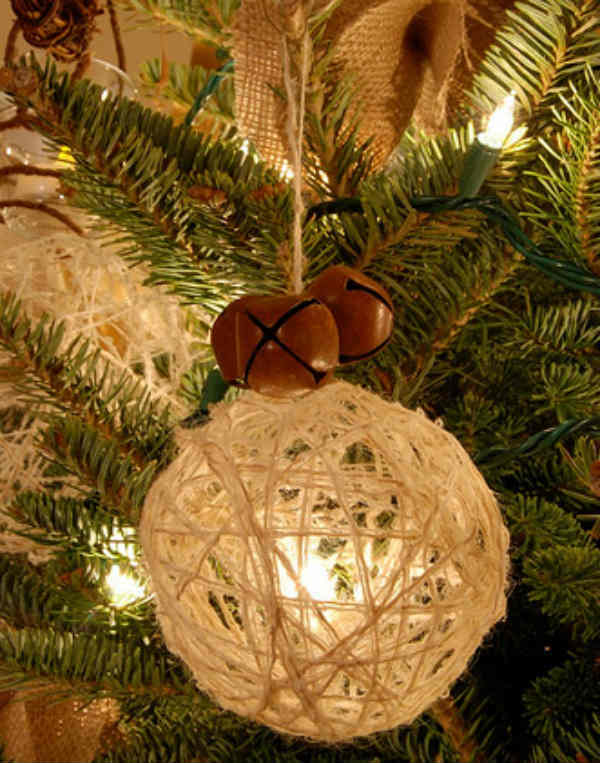 Why not branch out when you put up your tree this year and add a personal touch with a few DIY decorations? We’ve found the perfect easy-to-make ways to put more festive fever into your home. Do a quick search for DIY Christmas wreath on Pinterest and you’ll find plenty of ideas to spruce up your front door. 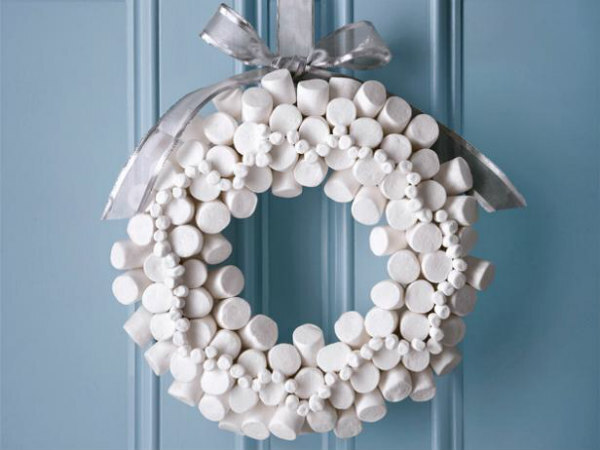 But the 30-minute marshmallow wreath (above) by Food Network would have to be one of my favourites – I wonder if it tastes as good as it looks? Check out Food Network’s other gorgeous food-themed wreaths too. Inside, spread Christmas cheer with some coloured or patterned cardboard, pegs and string to make a pretty garland such as this one by Vicky Barone. Blow up a balloon, wrap it with string or lace, paint with glue, and once dry pop the balloon. You’ll get something like this gorgeous bauble from Cry Baby Ink. 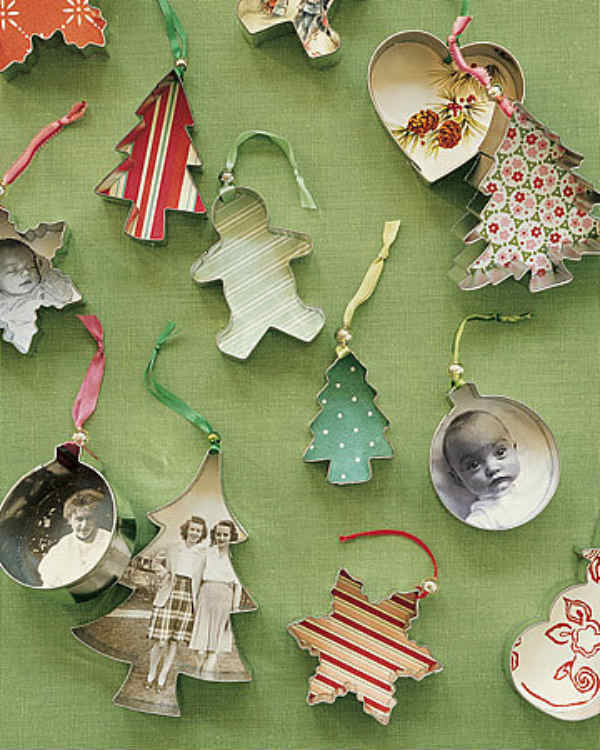 You’ve got to love an ornament you can make from things you probably already have lying around in your home or garden. 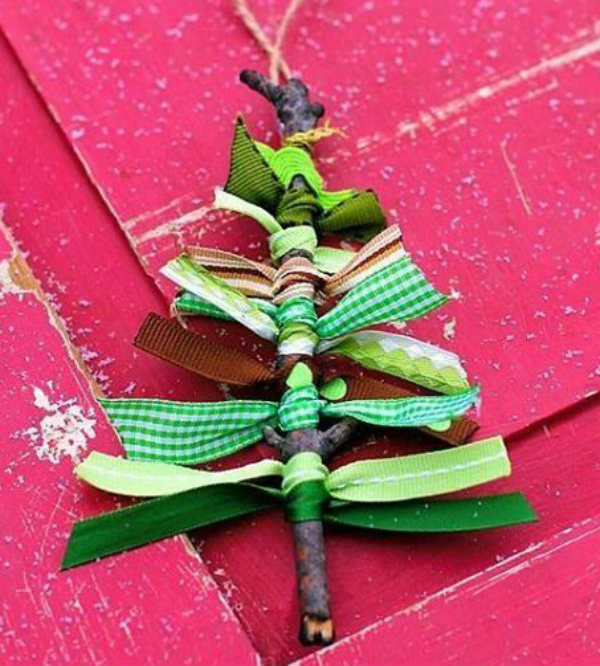 Take this scrap ribbon tree from The WoW Style, for example – find a twig, find coloured pieces of ribbon, tie to the twig, cut to shape, and voila! Who says baked treats can only be used as gifts? 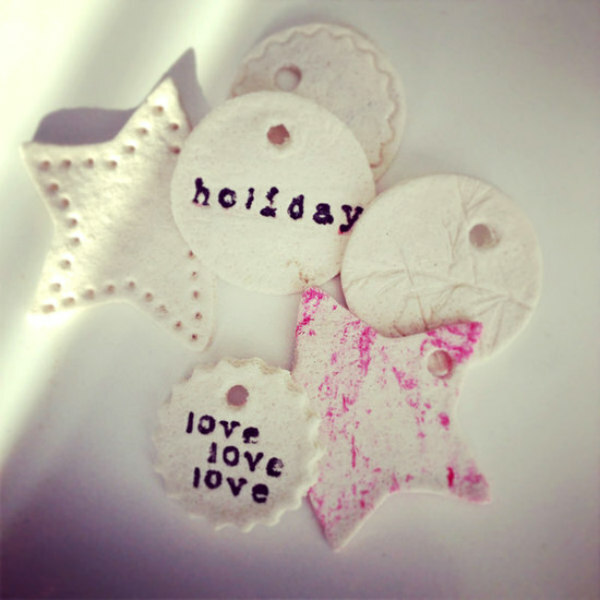 These salt-dough decorations from PopSugar make sweet ornaments – and even better, they can double as gift tags. I love this idea for baby’s first Christmas. According to DIY & Crafts, creating this precious keepsake is as easy as tracing your baby’s foot on to a plain ornament with a pen or narrow Sharpie, then filling with glue and glitter. Or for another personal touch, put photos, kids’ drawings or just wrapping paper into these Martha Stewart cookie cutter ornaments. Many families go to huge effort to make a special Christmas lunch or dinner – so it’s only fitting that the table looks the part. 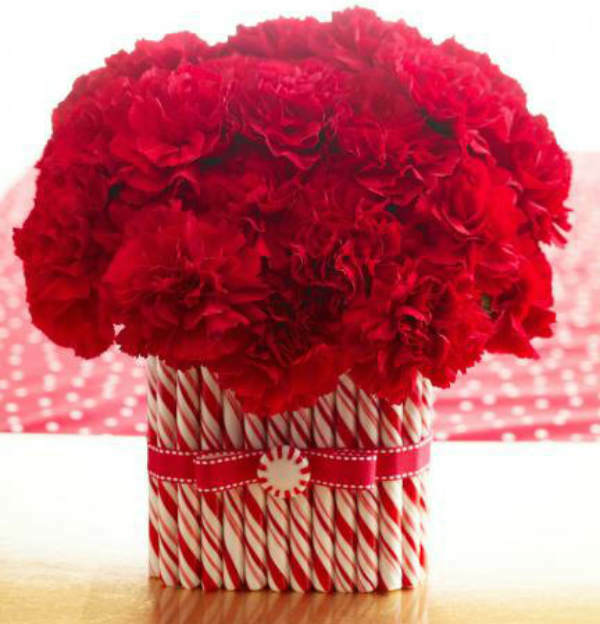 This centrepiece from Midwest Living – with candy canes glued around a vase of carnations (any red flower will do) – will do the trick nicely. Of course there’s no reason you have to limit decorative cheer to just your home. 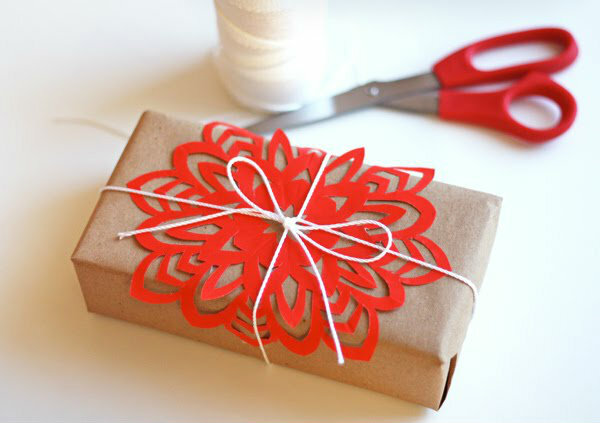 Paper snowflakes such as these at How About Orange can be strung together to make a garland, but they can also be used as a gift topper to dress up plain wrapping paper. 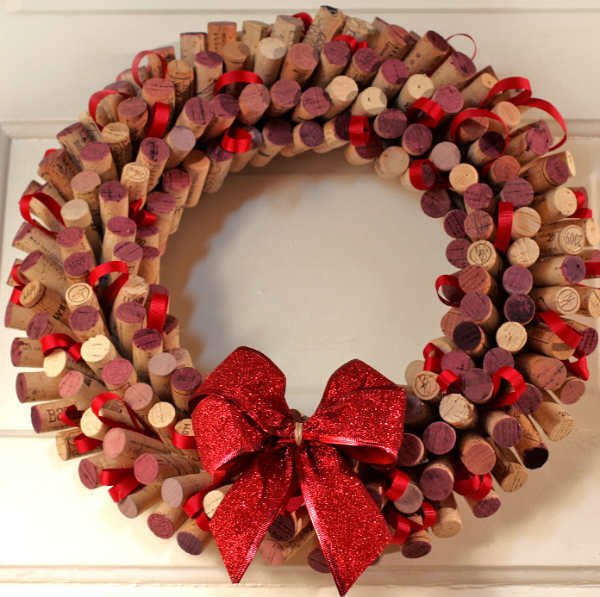 And finally, it is the festive season so you may have a few wine corks at the ready. Why not recycle them for a wreath – follow the tutorial at Wine Folly, then pop it on your door and drink in the Christmas cheer! 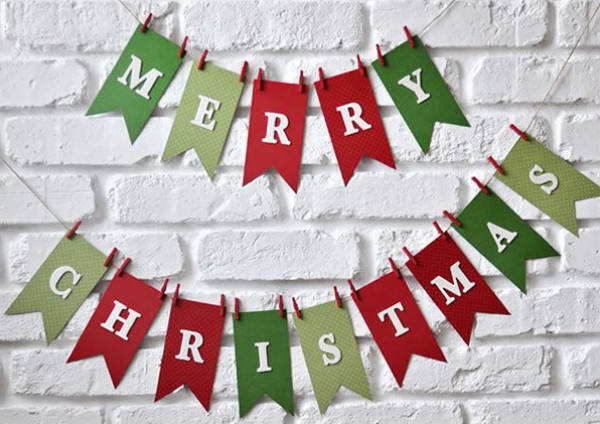 For more inspiration, check out our post on Christmas craft tutorials or get last-minute gift ideas in our Christmas collection.